We arrived in Western Cape at a time when the nation is changing for the better. Although the drought in the area is severe, we are hopeful in given promises of a turnaround not just in rain, but for the spiritual rain of revival. When we arrived in Worcester, we trusted the Lord for a long term affordable home and place to minister. We were led to a small house in a retirement community and ministry opened up in a variety of places. Since most of the people we minister to are in the townships, we’re going to where the people are. We have found the people in Worcester open and thirsty for the love of Jesus. We have partnered with many ministries already in the town. One of Iris Western Cape’s mandates is to be family and to link ministries to each other. We are both networking and holding the nets to reap and sow love. We have become teachers through ‘MasterPeace Academy’ (to bright township kids). Tony teaches science (daily) and music (weekly), while L-A teaches art (weekly). Back in 2014, L-A had an impression that she would be teaching art to African children (as well as radio). It is such a joy that some of this is already happening. One of L-A’s pupils is gifted in art and he loves Tony’s science lessons as well. We especially love to see the kids grow in their learning and faith. They never cease to surprise us – with giggles, questions and sometimes lightning fast understanding. Tony has taken the boys swimming after school, since it has been so hot. And when Tony’s birthday came, they surprised Tony by singing Happy Birthday! We are part of a weekly ‘Riverview Kids Club’, where they love on Riverview township kids, sing, teach the Word and musical instruments. This group of kids are incredibly sweet and are eager to learn about God. 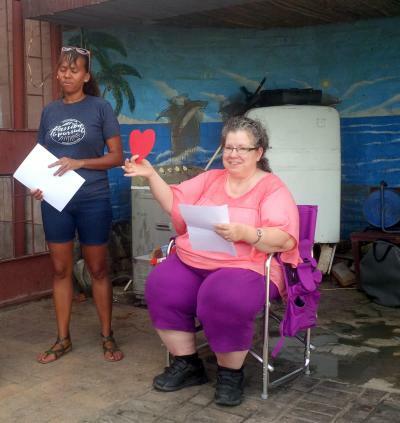 L-A shared with them a talk about forgiveness and changing a heart of stone into God’s heart of love – she used a small rock, a paper heart and maple candies. They listened with rapt attention and understood a concept that many grown-ups don’t always understand! L-A has been ill lately (something that may be remedied through an operation at the end of March). Due to the illness, she had to miss a Kid’s Club day. Some of the kids missed her so much that they wrote a note that said: “Mano and Coriya ask you how you are. Mano and Coriya miss you. We love you. We asked Mr. Tony where you are, and we will pray for you. We love you.” This was a special moment to cherish for weeks to come! Both of us are involved with ‘My Father’s House Worcester’, a community development project in Avian Park township. We reach out to gang members, teens and vulnerable women. We are involved with music on Mondays, Tony helps in food distribution, and L-An has helped them establish an internet presence with a brand new website. 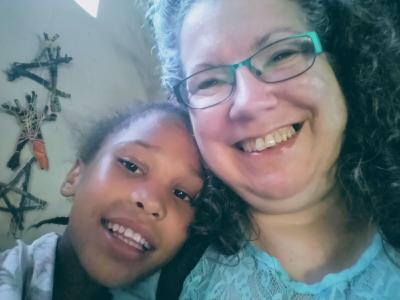 They’ve become fond of these teens, and L-A has become a mother figure to recent YWAM grad, Maria, who is called to be a long-term missionary. 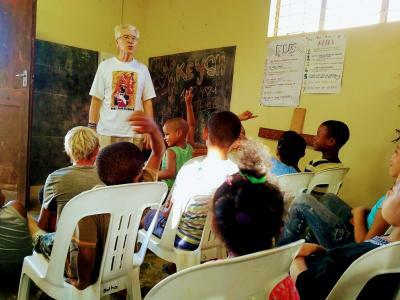 Tony weekly joins a YWAM-sponsored children’s ministry in the shanty-town section of Avian Park, and has made many friends in the local ‘Boland Hospice’. Both reach out with a local women’s shelter. Laurie-Ann felt strongly called to join a special ministry in the Roodewal Township that is called ‘Kibbutz El-Shammah’ - and they do many things, including the ‘Changemakers’ program for former gangsters and drug addicts. L-A drew a prophetic impression of that ministry and is now their bookkeeper! This strategic ministry has established such a presence in that township that crime rates are significantly lower than the other areas – but there is so much more to do. They are expanding to a second location on the other side of the township to form a canopy of love over the neighbourhood. We also are a part of the challenging Iris Western Cape ‘Farm Kids Club’. Three quarters of the group are wonderful learners, but some are utterly wild kids. We need to reach them consistently with God’s love, despite their unruly nature! Tony has taken to teaching the other kids financial matters, fun science knowledge and matters of faith. They also love singing and dancing during our worship sessions. Otherwise, we trust for divine keys to reach these farm kids. We just received the last clearance papers to become prison volunteers in Brandvlei, with ‘Prison Alpha’. We connected with the chaplain, and the national South Africa Alpha director, Jeremy Jobling. Jeremy had commissioned a Cape Town prison Alpha team to go weekly to this Worcester-area prison, yet it wasn’t sustainable, because of the drive there and back. And then - along come the Copples at just the right time! We are so excited for this opportunity! We even will have a close ministry friend who speaks Afrikaans join us when she has her own clearance. While we practice the Iris lifestyle of stopping for the one, we also joined our local church’s ‘Street Evangelism Team’, and are making more connections as we do this – in town and in church. We have been connecting the nets of these and other ministries in Worcester. We intentionally promote unity and family among all who minister and love Jesus. Lastly, we started another ministry within our hill-top home. We’re back on the radio through ‘Copples Western Cape Radio (CWCP)’, an internet radio station that broadcasts weekly through Galcom international. We are broadcasting interviews, South African faith stories, music, and teachings. We plan to involve children within the broadcasts, and in future, a radio camp. Laurie-Ann is also producing art work, and has been encouraged to do this within the context of our church creative team and more. We are so hopeful for our time in South Africa. While we have had a lot of challenges, these do not compare with the blessings we have encountered, the people we’ve met and the grace of the Holy Spirit that has filled so many of our times. We invite you to visit our website, coppleswesterncape.ca, and we are on Facebook, Twitter and Instagram. We invite you to join our newsletter emails by emailing L-A at kootenaysprayer@gmail.com.